The news that OPEC was cutting production and that a Trump administration could open up some new oil and gas opportunities had even the biggest names in the business soaring double digits last month. Shares of some of the largest oil services companies had big gains in November. The largest of those gains coming from both the election of Donald Trump and the announcement that OPEC is looking to cut overall oil production by 1.2 million barrels per day to raise prices. Here's a quick list of the big oil services companies that saw greater than 10% jumps in November from these two events. It's a pretty rare occasion when big, well established businesses like these see double digit changes in such a short time frame. However, a large part of these gains had to do with a bunch of prior factors that seemingly came to a head. HAL Revenue (TTM) data by YCharts. More recently, though, we have started to see some small signs that the market has been improving. Oil prices have been slowly ticking back up from lows of $25 a barrel back in January, and drilling activity -- a much more important factor for services companies -- has been modestly picking back up as a result. Granted, we're still a long ways off from activity highs in 2014, but at this point in time any gains will help. 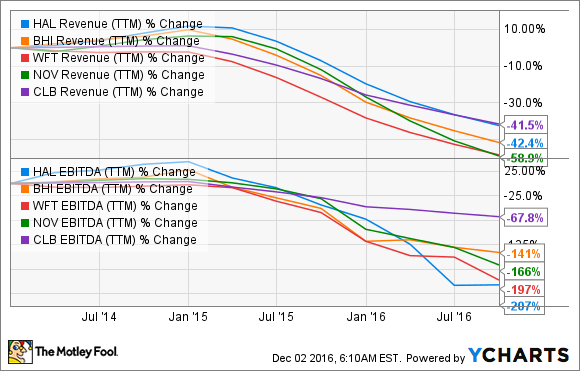 Also, before this month, just about every company in this group was giving a slightly more optimistic outlook for 2017. Core Labs, Halliburton, Weatherford, and Baker Hughes all mentioned in their most recent conference calls that they were expecting a turnaround in activity starting in the fourth quarter. National Oilwell Varco was a little more muted, though, as its business is much more tied to selling big ticket items like offshore drilling rig equipment that is expected to take a while longer to recover. So with that backdrop, you have the election of Donald Trump and the OPEC production cut announcement. The most significant news is the OPEC cuts as it should help to accelerate the tightening of the oil supply and demand imbalance we have seen over the past several years. As those cuts take hold, it will likely lead to greater exploration and development from the big spending clients like integrated oil and gas companies. On top of that, there is the possibility that the Trump administration will loosen regulations on oil and gas. This could entail opening more federal land for drilling as well as lifting the moratorium on auctioning offshore licenses in both the Atlantic and the Arctic Oceans. There are some hurdles to these plans, so investors should take these two things with a grain of salt. That being said, drilling these new lands as well as offshore blocks are service intense types of oil and gas drilling, and would be rather lucrative for service businesses. There is a lot to unpack with these companies as we move into the recovery phase of the oil and gas industry. Overall, the trend as of late has been an improving market, but these recent news events, if all come true, would certainly accelerate that recovery. That doesn't mean, though, that all of these companies will immediately benefit from the spoils. For example, Halliburton's business is much more heavily tied to shale drilling in North America, and that is the part of the business that is expected to see a faster recovery. On the flip side, National Oilwell Varco's largest business segment has historically been selling big ticket items. While it could see an uptick from selling aftermarket parts, the large supply of rigs that were built over the past several years likely means growth in this segment will be much slower as we work through the current oversupply. For any investor looking at any of these stocks now as we see the turnaround finally here, it's important to keep these timetables in mind. The catalysts seem to be in place for a recovery, but think about the timetable for each of these individual stocks if one is on your potential buy list.